WooHoo!!! Heeeee’s baaack! If you follow me, then you know how much I enjoy Vincent Zandri’s novels. I have read every single book except one and that is waiting for me in my Kindle. 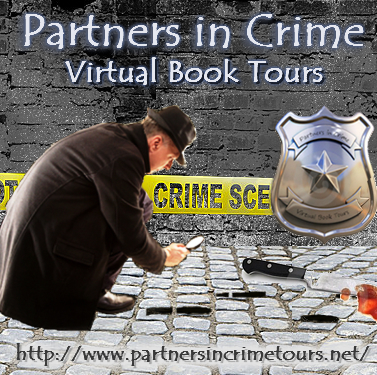 And today is super special because not only is he back to talk about one of newly published books, today he kicks off his tour with Partners In Crime Tours. So please help me give a very warm welcome to author and friend, Vincent Zandri!! Visit Vin at his website, Facebook and Twitter. Follow Vincent Zandri’s tour here and enter to win a copy of Concrete Pearl, Moonlight Rises and/or Blue Moonlight. Captain Nick Angel has finally made a separate peace with the war in Afghanistan. Since having been ordered to bomb a Tajik village which resulted in the death of a little boy of no more than two, he’s been suffering from temporary bouts of blindness. Knowing the he needs time to rest and recover from his post traumatic stress, the US Army decides to send him to Venice along with his fiancee, the artist, Grace Blunt. Together they try and recapture their former life together. But when Grace suddenly goes missing, Nick not only finds himself suddenly alone and sightless in the ancient city of water, but also the number one suspect in her disappearance. A novel that projects Hitchcockian suspense onto a backdrop of love and war, The Disappearance of Grace is a rich, literary thriller of fear, loss, love, and revenge. From the war in the Afghan mountains to the canals of romantic Venice, this is a story that proves 20/20 eyesight might not always be so perfect and seeing is not always believing. The wind picks up off the basin. It seems to seep right through my leather coat into flesh, skin and bone. I try and hold my face up to the sun while the waiter takes our orders. Grace orders a single glass of vino russo and a pancetta and cheese panini. I forgo the Valpolicella and order a Moretti beer and a simple spaghetti pomadoro. The waiter thanks us and I listen to him leaving us for now.We sit in the calm of the early afternoon, the sounds of the boat traffic coming and going on the basin filling my ears. People surround us on all sides. Tourists who have come to San Marco for the first time and who’ve become mesmerized by it all. I don’t have to physically see them to know how they feel. The stone square, the Cathedral, the bell tower, the many shops and high- end eateries that occupy the wide, square-shaped perimeter. The pigeons. The people. Always the throngs of people coming and going amidst a chorus of bells, bellowing voices, live music emerging from trumpets, violins, and guitars, and an energetic buzz that seems to radiate up from underneath all that stone and sea-soaked soil.It’s early November.Here’s what I know about Venice: In just a few week’s’ time, the rains will come and this square will be underwater. The ever sinking Venice floods easily now. The only way to walk the square will be over hastily constructed platforms made from cobbled narrow planks. Many of the tourists will stay away and the live music will be silenced. But somehow, that’s when Venice will come alive more than ever. When the stone is bathed in water.The waiter brings our drinks and food. With the aroma of the hot spaghetti filling my senses, I dig in and spoon up a mouthful. I wash the hot, tangy sauce-covered pasta down with a swallow of red wine. “Whoa, slow down, chief,” Grace giggles. She laughs genuinely and I listen to the sounds of her taking a bite out of her sandwich. But then she goes quiet again. Too quiet, as if she’s stopped breathing altogether. “There’s someone staring at us,” she says under her breath. “Man or woman?” I say, trying to position my gaze directly across the table at her, but making out nothing more than her black silhouette framed against the brightness of the sun. Later on, when the sun goes down, the image of her will be entirely black. Like the blackness of the Afghan Tajik country when the fires are put out and you lie very still inside your tent without the benefit of electronic night vision, and you feel the beating of your never- still heart and you pray for morning. She’s stirring in her chair. Agitated. I wipe my mouth clean with the cloth napkin. I do something entirely silly. I turn around in my chair to get a look at the man. As if I have the ability to see him right now, which I most definitely do not. “What are you doing?” Grace poses, the anxiety in her voice growing more intense with each passing second. I turn back, try and focus on her. Once more I am helpless and impotent. My pulse begins to pump inside my head. Not rapid, but just enough for me to notice. Two steady drum beats against my temples. I find myself wanting to swallow, but my mouth has gone dry. I take a sip of beer thinking it will help. Heart beat picks up. I feel it pounding inside my head and my chest. “Are you sure he’s coming towards us, Grace?” I’m trying not to raise my voice, but it’s next to impossible. I feel and hear Grace pulling away from the table. She’s standing. That’s when the smell of incense sweeps over me. A rich, organic, incense-like smell. There comes the sound of Grace standing. Abruptly standing. I hear her metal chair push out. I hear the sound of her boot heels on the cobbles. I hear the chair legs scraping against the stone slate. I hear the sound of her wine glass spilling. But she doesn’t respond to me. Or is it possible her voice is drowned out by what sounds like a tour group passing by the table? A tour group of Japanese speaking people. But once they pass, there is nothing. No sound at all other than the boats on the basin and the constant murmur of the thousands of tourists that fill this ancient square. But there’s still no response. The smell of incense is gone now. I make out the gulls flying over the tables, the birds shooting in from the basin to pick up scraps of food and then, like thieves in the night, shooting back out over the water. I can hear and feel the sound-wave driven music that reverberates against the stone cathedral. It’s like she’s gone. Vanished. But how can she be gone? She was just sitting here with me. She was sitting directly across from me, eating a sandwich and drinking a glass of wine. She was talking with me. “The signora is not liking her food?” he questions. I reach out across the table. In the place where she was sitting. She is definitely not there. The waiter pauses for a moment. I listen to the waiter leaving, his footsteps fading against the slate. Grace didn’t say anything about going to the toilet or anywhere else. Grace was frightened. She was frightened of a man who was staring at her. A man with sunglasses on and a cropped beard and a long brown overcoat. He was the man from yesterday. The man with black eyes. He was approaching us, this man. He came to our table and he smelled strongly of incense. He came to our table. There was a slight commotion, the spilling of a glass, the knocking over of a chair, and then Grace was gone. I sit and stare at nothing. My heart is pounding so fast I think it will cease at any moment. What I have in the place of vision is a blank wall of blurry illumination no longer filled with the silhouette of my Grace. I push out my chair. Stand. My legs knock into the table and my glass spills along with Grace’s. I cup my hands around my mouth. The people who surround me all grow quiet as I scream over them. The waiter comes running back over. He begins leading me through the throng of tables and people. He is what I have now in the place of Grace. He is my sight.